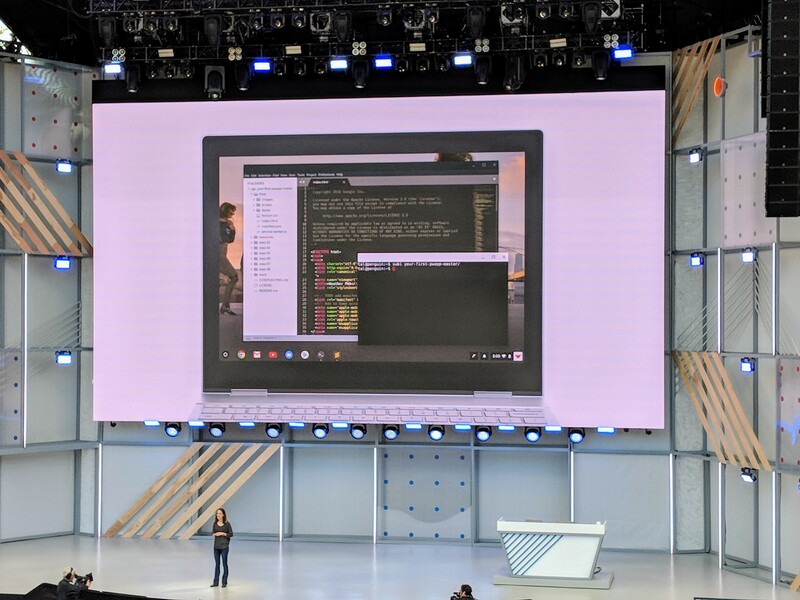 For the longest time, developers have taken Chrome OS machines and run tools like Crouton to turn them into Linux-based developer machines. That was a bit of a hassle, but it worked. But things are getting easier. Soon, if you want to run Linux apps on your Chrome OS machine, all you’ll have to do is switch a toggle in the Settings menu. That’s because Google is going to start shipping Chrome OS with a custom virtual machine that runs Debian Stretch, the current stable version of the operating system. It’s worth stressing that we’re not just talking about a shell here, but full support for graphical apps, too. That means you could now, for example, run Microsoft’s Linux version of Visual Studio Code right on your Chrome OS machine. Or build your Android app in Android Studio and test it right on your laptop, thanks to the built-in support for Android apps that came to Chrome OS last year. The first preview of Linux on Chrome OS is now available on the Pixelbook, with support for more devices coming soon. Google’s PM director for Chrome OS Kan Liu told me the company was obviously aware that people were using Crouton to do this before. But doing this also meant doing away with all of the security features that come with Google’s operating system. And as more powerful Chrome OS machines hit the market in recent years, the demand for a feature like this also grew. To enable support for graphical apps, the team opted to integrate the Wayland display server; from the user’s perspective, the actual window dressing will look the same as any other Android or web app on Chrome OS. Most regular users won’t necessarily benefit from built-in Linux support, but this will make Chrome OS machines even more attractive to developers — especially the more high-end ones like Google’s own Pixelbook. Liu stressed that his team spent quite a bit of work optimizing the virtual machine, too, so there isn’t a lot of overhead when you run Linux apps — meaning that even less powerful machines should be able to handle a code editor without issues. Now, it’s probably only a matter of hours before somebody starts running Windows apps in Chrome OS with the help of the Wine emulator.